What is a Chant Rehearsal with Turkington Like? Solemn Profession of Br Lawrence Lew, O.P. The People vs. The Trained Elites? Is Catholic-Orthodox Unity in Sight? What's wrong with this prayer? Solemn Profession of Brother Lawrence Lew, O.P. 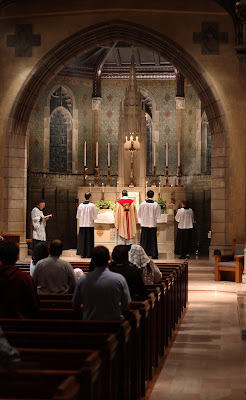 Mass in the Extraordinary Form was offered for (what we believe is) the first time in a great number of years (possibly since the reform) in St. Mary's chapel at Boston College on the Feast of St. Michael. Fr. Augustin Anda of the Boston Archdiocese was the celebrant. Men from Boston College's adoration group, the St. Thomas More Society, served at the altar. The "Schola Amicorum," which also sings at other local Boston EF Masses, provided chant. Roughly 25-30 people, a majority of them students, prayed at the Mass. 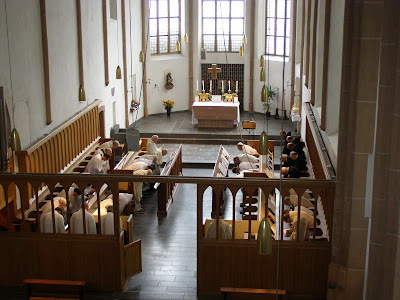 The NLM is told that this group of students has aspirations to have monthly Mass offered in the usus antiquior, as well a monthly Mass in the modern Roman liturgy which employs Latin and ad orientem. As always, it is encouraging to see these matters approached from the lens of both forms of the Roman liturgy. Summorum Pontificum, issued by Pope Benedict XVI in 2007, is an act of peace above all else. 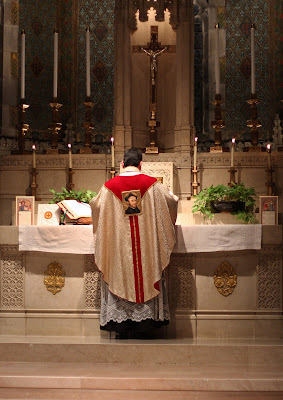 It humbly seeks to rectify a terrible misstep in the history of Catholic liturgy, namely a series of decisions and a variety of pressures that gave the impression that the Missal of 1962, the last Missal of what had come to be known at the Tridentine Mass, was no longer permitted to be said in public or private. It was a shocking way to put an end to some 1500 years of liturgical history, a move of such illiberality that was essentially unprecedented in Catholic history, and one which caused enormous damage by any measure. Defenders of the shift cite the benefits that stemmed from the new Missal in English. There is no real reason to enter into a debate on this point. 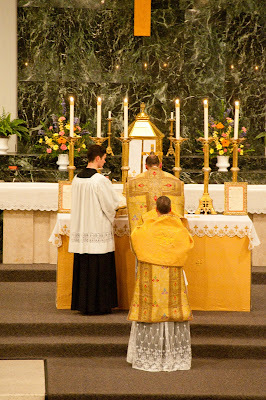 If the new Missal had so much to offer the Catholic world, and so many graces have flowed from its use, it still would not have been necessary to impose it with force and at the expense of what has sometimes been called the "Mass of the Ages." Whatever the merits or demerits of the 19070 Missal structure, it was the method by which it was impose upon the priests and faithful that was the sorest point of all. In recognizing this and having the courage to do something about righting this wrong, Benedict XVI deserves the highest possible praise. His approach here is consistent with all of his writings that reject the power of the sword, reject the use of power, and reject the ethos that faith flows from laws rather than the action of hearts and minds. His watchwords are faith, hope, and charity -- and these are also the central themes of Summorum Pontificum. It grants the freedom for priests to serve the faithful in ways that should have been permitted all along. As part of the peace offering here, the Pope very helpfully gave us new terms for what to call the form of Mass that was unjustly suppressed. He called it the extraordinary form in order to distinguish it from the ordinary form of the 1970 Missal. There is one rite in two forms, he wrote. It is time that the break in liturgical history be healed so that we can integrated our present with the past and move forward into an era of mutual understanding, support, and unity. 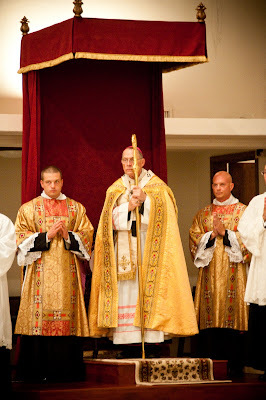 Let us be clear on what Summorum Pontificum does not do. It does not wage war on the Novus Ordo Missae. 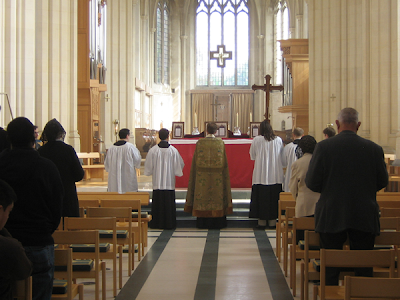 It does not put down average Catholics who like Mass in the vernacular. It does not disparage the work of the typical parish environment to keep the faith thriving in difficult times. It does not undertake any acts of vengeance. It seeks no punishments for anyone. It is even light on the mandates, asking only for priests and faithful to be permitted the freedom to worship according to older forms. It is his hope that the older form can be peacefully integrated into the existing Catholic experience in a way that will enrich our lives. 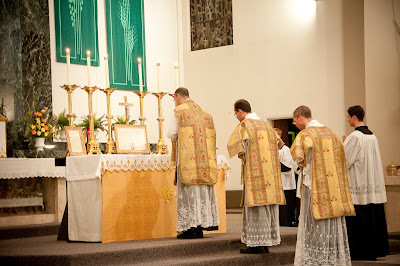 As an example, this past weekend in Montgomery, Alabama, a parish introduced the extraordinary form at a Sunday Mass, a Missa Cantata the likes of which had not been experienced by any living member of that parish. 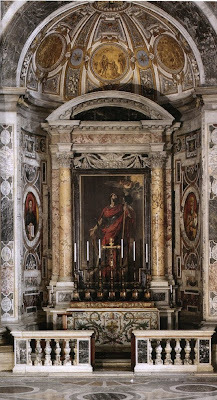 The pastor called upon the services of the Fraternity of St. Peter. Apart from that, however, the experience drew entirely on resources that were made available from the ordinary-form sector of Catholic experience. The choir that sang the propers in Gregorian chant and a polyphonic setting from William Byrd had been singing faithfully at the ordinary form for eight years, and it is in a normal parish with the ordinary form where they learned how to accomplish the daring feat of singing the large-scale. The organ in the parish was recently restored thanks to contributions of regular parishioners who attend only the ordinary form. For that matter, the building itself has been maintained and beautified by Catholics who have celebrated in the ordinary form. The pastor who made all of this possible was drawn to Catholicism via the ordinary form and this was the form under which he was ordained. In other words, this revival of the extraordinary form in this context would not have been possible were it not for the dedication of people who for forty years have faithfully done what they believed the Church was asking of them. Today, they stand ready to support the spirit of Summorum Pontificum, in charity, faith, and hope. 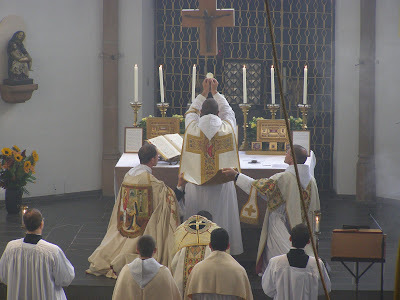 This is a beautiful thing to see: we see two forms of the rite mutually enriching each other. What a contrast from the past days. I'm thinking of the 1980s and 1990s when it was war to the knife between the people attached to one form or the other. Every day there were mutual excommunications. Families split down the middle. Publications had to choose and base its marketing on such decisions. Catholic laypeople sensed the need to make a decision, loyalty to one or the other. There developed intense pockets of hatred throughout the Catholic world. I can recall being in an EF parish and talking to some people after Church and hearing them put down anyone slightly to the left or to the right of precisely where they stood on these questions as a parish. I can recall thinking: this is not the way it should be! This is not the Catholic spirit at work but rather a protestant-style sectarianism that is deeply inimical to unity. It feeds the ego, fosters pride, and thrives on detraction. I do wonder whether or not Catholics themselves are prepared to rise to the high standards than Summorum Pontificum sets for all of us. Are we will to put down our weapons and work together? It accomplishes very little, for example, to march into a local parish waving a copy of Summorum along with a petition, as if the goal were to demand one's rights to the old Mass. This whole approach does real damage to the cause. These tactics are fine for politics but they do not work in a real Catholic parish. Nor does it accomplish anything in a parish environment to aggressively criticize existing practices and liturgical forms. People who do this need to consider that they might be harming the cause. There should be some agreement about the rules of engagement in the future (Fr. Z has five for starters). The extraordinary form should be welcome in parishes. At the same time, the promoters of the extraordinary form need to realize that many people are suspicious about what this all means; they need to anticipate some degree of resistance and learn to work around it with love and respect. The extraordinary form must be woven into the fabric of existing communities; the people who grow to love it are going to come within the existing Catholic milieu, people who not going to be attracted by spite and aggression and acts of vengeance. All of that and the rhetoric that surrounds that approach needs to be left in the past. There is nothing to be gained by frenzied attacks on the Mass that existing parishioners have come to know and love. A future of liberality, charity, and mutual enrichment is the one that Pope Benedict XVI hoped for with his motu proprio, and people who call themselves "traditionalists" must lead the way by example. Some further photos from the ordinations that were recently offered in the Diocese of Frejus-Toulon according to the usus antiquior have now become available. I am told that the homily is well worth exploring as well -- though I have not as yet had an opportunity to look at it. For the moment, here are some of the photos. 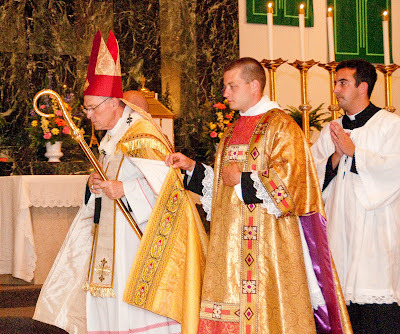 While still the Archbishop of St. Louis, Archbishop Raymond Burke commissioned the Saint Louis Hymnal for the Hours and also established the Institute of Sacred Music with Fr. 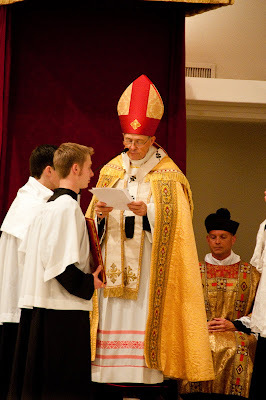 Samuel Weber, OSB, taking the role of director within the new institute -- all of which has since also been confirmed by the new Archbishop of St. Louis, Robert Carlson. The NLM recently received an audio clip and copy of the Hymn for Lauds and Vespers for the Feast of St. Jerome, as well as a commentary and translation by the Rev. Mr. Dylan Shrader who is also at Kenrick-Glennon Seminary. The music is based on traditional chant tones, adapted by Fr. Samuel F. Weber, O.S.B. The text used is translation by Rev. Mr. Dylan Schrader. The clip is sung by the schola cantorum of Kenrick, directed by Fr. Samuel Weber, OSB. On this, the Feast day of St. Jerome, it seems pertinent to share this new endeavor. 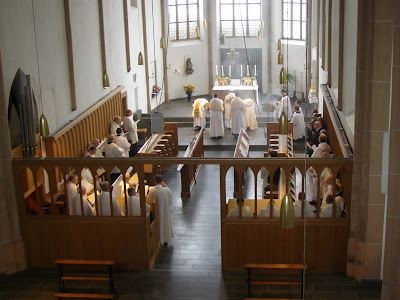 As recently mentioned, Mariawald Abbey, the German Trappist abbey which last year had received the privilege conceded by the Holy Father of a complete return to the Liturgy and the Observance in use in the Order of Cistercians of the Strict Observance (Trappists) until 1963/64, yesterday celebrated the centenary of its erection as a Trappist abbey with a Pontifical Mass sung by the abbot, Dom Josef Vollberg. Our friend Martin Bürger at EXSVLTET has photos. Fr. Finigan's post reminded me of my own attachment to this saint, and it made me ponder that particular attachment further. The Christmas Carol Good King Wenceslaus -- which, as Fr. Finigan notes, is no doubt the reason why so many of us in the English speaking world have heard of the saint at all -- was a childhood favourite of mine. With that came a further curiosity about the person of the "Good King" and ultimately an attachment and devotion to St. Wenceslaus himself which is with me to this very day. This perhaps speaks in its own particular way to the words expressed by St. Francis Xavier, give me the child to the age of seven and I will show you the man. This can, and of course does, have a much broader application than simply fostering devotion to a particular saint, but it seems to me that this tiny example speaks again of why our various customs, traditions and practices -- both those that we find within the walls of our churches proper and without in the context of the domestic church -- are particularly important to foster and exercise, for they have the power to influence and to form, planting the seeds that might later bloom. Anyone who doubts the vibrancy and growth of sacred music in our time should consider the events related to the Chant Pilgrimage of 2009, held at the National Shrine of the Immaculate Conception in Washington, D.C., September 25-26. It was organized to provide a two-day chant tutorial in the Year of Jubilee of the Basilica. It was sponsored by the Church Music Association of America and co-sponsored by the John Paul II Cultural Center and St. John the Beloved in McLean, Virginia. Events took place in the Center and the crypt of the Shrine. Attendance was well above what any of the organizers had expected. More than 160 people came to hear a lecture by William Mahrt, editor of Sacred Music, and learn to read and sing chant under chant master Scott Turkington of St. John Evangelist in Stamford, Connecticut. Attendees came from seminaries, parishes, convents, and from cities and towns all over the country. The diversity of the attending group was so vast as to be impossible to characterize. There were young people, older people, and everyone in between; some of whom had been singing chant for years and others for whom this was a completely new art. Many of the teens attending had already decided to take on the task in preparation for singing in their college and university chapels and preparing for a future starting parish scholas at home. The pilgrims worked to prepare the ordinary chants for the Mass in the extraordinary form at the Shrine on Saturday evening. The choice was for Mass IX, a setting traditional for the Common of the Feasts of the Blessed Virgin Mary. A chant schola sang the propers of the Mass so that pilgrims could focus on the main chants for the Mass. What was most remarkable was the surprise that greeted everyone at the Mass. It was not the first extraordinary form Solemn Mass in the crypt in decades but it might have been the most well attended. The organizers had made 250 programs, thinking that this would surely be enough. Not only did they run out; the number of attendees including pilgrims might have exceeded 300 or even 350 or more. And this was without any real promotion. The Mass itself was an unforgettable experience. It was celebrated by Rev. Franklin M. McAfee, D.D., Pastor Emeritus, St. John the Beloved Church. The deacon was Rev. Paul D. Scalia, Pastor, St. John the Beloved Church. The subdeacon was Rev. John Fritz, S.T.L.. The organist for the day was David Lang of St. John the Beloved. The role of the master of ceremonies was assumed by David Alexander. Included in the liturgy was the choir of the Basilica under the direction of Peter Latona. His unaccompanied choir sang Marian motets by both Palestrina and Byrd. The homily on the centrality of beauty in Catholic aesthetics was offered by Fr. McAfree, who was flooded with requests for printed copies following the Mass. It is remarkable to consider the role that Pope Benedict XVI's moto proprio Summorum Pontificum plays in this drama. This is the 2007 document that provided a full liberalization of the last Missal used before the end of the Second Vatican Council. 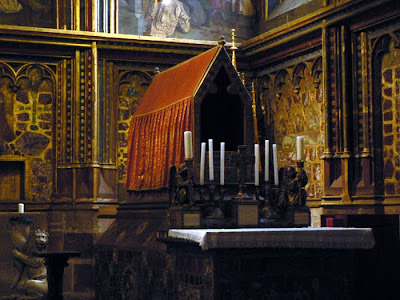 It is this structure that provided the creative tableau for the whole of the Gregorian musical repertoire, and it continues to be beautiful home for chant and the complex rubrics of the traditional Roman Rite. But as the speakers reminded everyone, this music is also normative and preferred in the ordinary form as well. Two years ago, it might have been difficult to obtain permission for this form of the rite to be said in a place like the Shrine. Today, it is being used around the country and even in such central and prominent places at the National Shrine, without controversy or difficulty, and even with the full support of the Bishops. In this particular case, the rector of the Shrine, Monsignor Walter Rossi was especially encouraging and supportive of these efforts. The propers of the Mass were as follows: Savle, sancta Parens (Introit), Benedcita et venerabilis (Gradual), Post partum Virgo (Alleluia), Ave Maria (Offertory), and Beata viscera (Communion). In addition to Kyrie, Sanctus, and Agnus from Mass IX, the choir sang the Gloria from Mass XV. The conference itself was organized by the CMAA's director of programs Arlene Oost-Zinner with the assistance of Elizabeth Poel, the D.C. pilgrimage coordinator. This is one of many programs put together by the CMAA, which is seeing increases of up to 50% in all of its program attendance. The much larger-scale Sacred Music Colloquium is at Duquesne University, Pittsburgh, Pennsylvania, June 21-27, 2010. David Clayton of Thomas More College has prepared another article for the NLM which we are pleased to present. Here is his abstract of the article, followed by the article itself. All creation gives praise to God. More precisely it directs our praises to Him. Through its beauty we naturally discern the thumbprint, so to speak, of the Creator and our spirits are moved to love the source of what we see. Christian cosmology is the reading of the order of nature as a symbolic language and the mathematical description of that order, assigning a symbolism to those numbers. 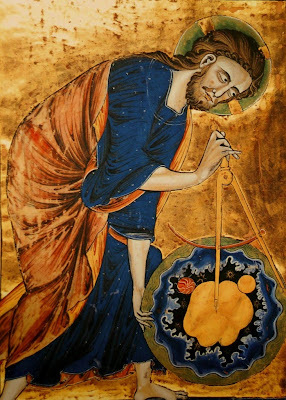 This article describes how the Church Fathers, especially Augustine and Boethius, described the patterns and harmonies in creation as mathematical ideals and understood them to point to the divine, the ‘mind of the Creator’. They then become a set of principles that can guide us in all our activities and traditionally were the basis of all Christian culture. 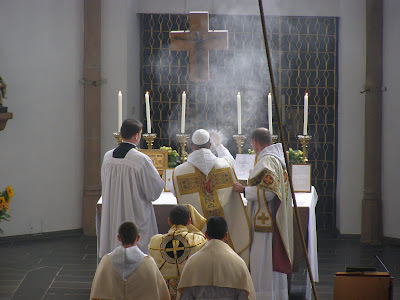 The perfect manifestation of the Divine Order is in the liturgy and through our participation in it we can conform to that order fully with God's grace – the Mass is a supernatural step into the heavenly order. These mathematical ideals, therefore, become a set of principles by which we can order all our activity liturgically and, through grace, create beauty that, in turn, directs the souls of others to heaven and to joy. Amongst modern writers, Pope Benedict XVI has drawn our attention to this often. This is the first of a number of articles that describe these ideas and their application. In the present article the principles are outlined. In following articles I will describe in more detail the symbolism of each number, traditional ideas of proportion and harmony, and how they are applied in our everyday work. 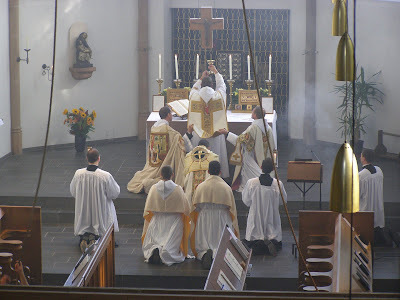 This is culture in the broadest sense of the word – work, education, leisure, arts, music - founded on the cult of the Mass and the whole liturgy. Here you see Reality Chant, a live rehearsal with Scott Turkington from the Chant Pilgrimage. Great material here. This is just fantastic and brilliant, and affordable. "Tradition meets technology" indeed. Dom Mocquereau smiles. Liber Pro takes the 1961 Liber Usualis, a book of over 2,300 pages of Gregorian Chant for use throughout the liturgical year, and literally puts it at your fingertips on your iPhone or iPod Touch. Liber Pro adds to this tome a linked table of contents, user-defined bookmarks, vertical and horizontal paging and zooming, browser-like navigation, a dynamic liturgical calendar, and more. Liber Pro is more than just an eBook. It is also the complete 1961 Roman Calendar, capable of calculating the moveable feasts throughout the year automatically. This means you can select a date; view the proper, common, and feria for that date; and jump instantly to the relevant pages in the Liber Usualis. The next two installments in our series of considerations of the reforms to the Roman breviary will consider the neo-Gallican Parisian breviary and its psalter. It is beyond the purpose of this series of articles to give a detailed description of the neo-Gallican office. To do so would be to repeat, unnecessarily, the work of Dom Prosper Guéranger in the second volume of his famous Institutions Liturgiques. (http://www.abbaye-saint-benoit.ch/gueranger/institutions/) Dom Guéranger’s book was written in an avowedly polemical spirit, as part of his great and ultimately successful project to bring about the abolition of the neo-Gallican books, and a return to the unity of the Roman liturgical tradition. His assessment of the neo-Gallican use is generally negative; one of the headings to his first chapter about them is “the beginning of liturgical deviation in France.” More recent writers such as Msgr. Batiffol and Archdale King have been less harsh in their judgment. The latter offers a very useful summary of the whole movement in The Liturgies of the Primatial Sees, after his description of the ancient use of France ’s primatial see, Lyons , a use which was almost completely ruined by the neo-Gallicans. If the purpose of this series were to give a more general history of recent liturgical reform, including the Missal along with the Breviary, and reaching into the post-Conciliar period, it would need to say a great deal more than I intend to about the neo-Gallican liturgy. The pages in which Mr. King describes its innovations to both Missal and Breviary could almost be a recipe book for the post-Conciliar rite. 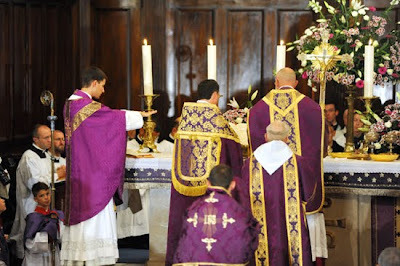 For the history of the Roman liturgy before the modern reform, however, there is one feature of the neo-Gallican use that is far more significant than all the rest. The French vogue for liturgical reform did not begin in the capital, and it did not begin with a Breviary or a Missal, but rather with a Rituale published for the use of the clergy of Alet, in the southern Languedoc region. 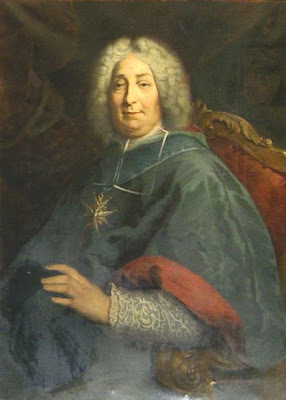 Paris did not lag far behind its distant province, though, and the first neo-Gallican revision of its Breviary was produced under the authority of Archbishop François de Harlay in 1680. Mr. King points out that these new books generally omitted from the frontispiece the words “ad formam sacrosancti concilii Tridentini emendatum – emended according to the form (laid down by) the sacred council of Trent .” Although many texts were changed, the Psalter was left in the traditional order in use since the 5th or 6th century, and present in the Breviary of St. Pius V with one minor modification. 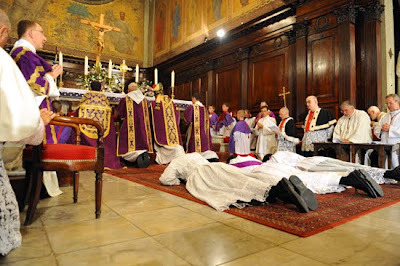 If one Archbishop of Paris could arrogate to his office the right to re-edit the liturgical books used in his See without reference to the Roman authorities, there was no particular reason why subsequent Archbishops should not avail themselves of the same right. Consequently, the liturgical books of Paris went through multiple revisions between 1680 and their definitive abolition in 1873. 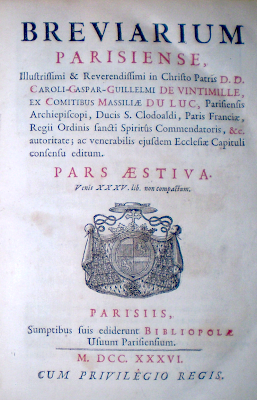 The most momentous of these is the 1736 edition of Archbishop Charles de Vintimille, and not only because it remained in use as the Office of France’s capital for nearly a century and a half, and provided the model for breviary revisions of many other French dioceses. Far more importantly, it would later, in 1911, provide the model for the first significant change to the Breviary of St. Pius V after Pope Urban VIII’s revision of the hymns. The ancient arrangement of the Psalter for Sundays and ferial days was designed around the recitation of the entire Book of Psalms over the course of a week. 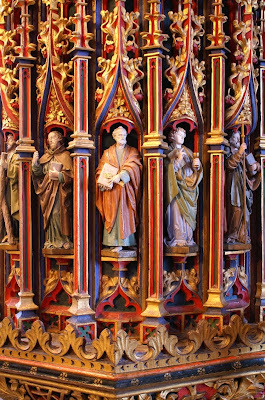 In an oft-quoted passage of his Rule, Saint Benedict says, “those monks show too lax a service in their devotion who in the course of a week chant less than the whole Psalter with its customary canticles; since we read, that our holy forefathers promptly fulfilled in one day what we lukewarm monks should, please God, perform at least in a week.” (chapter 18; transl. Rev. Boniface Verheyen, O.S.B.) Although the Roman Breviary and its allied uses had always maintained this tradition in theory, every feast day had proper psalms for Matins and Lauds, and almost always for Vespers. Thus, in reality, all the psalms were recited over the course of the week only in the very rare week in which no feasts at all occurred. This system was only very slightly changed by the reform of St. Pius V; recitation of the entire Psalter during any given week remained in practice an exception. It must also be kept in mind that in the traditional arrangement of the Psalter, the psalmody of Terce, Sext, None and Compline does not change from day to day, and that of Lauds and Prime changes but little; between them, these six hours contain only 25 of the psalms, the remaining 125 being divided unevenly between Matins and Vespers. The Parisian Breviary of 1736 created an almost completely new arrangement of the Psalter for Sundays and ferial days, with the stated purpose of restoring the tradition of reciting the whole Psalter in a week. In order to do so, however, it was also necessary to extend the use of the ferial psalms to the Saints’ days; feasts are therefore divided into seven grades, and in all but the two highest, the psalms of the feria said at every hour. The ferial psalms are also said at first Vespers and the following Compline of the highest two grades of feasts, a custom observed in several medieval uses. The new Parisian Psalter admits of no repetition at all among the psalms; each is said only once in the course of the week. Matins of Sunday is reduced from eighteen psalms to nine, and that of each feria from twelve to nine, conforming them to the pattern of Matins on feast days. The number of psalms at the other hours remains unchanged, and a canticle from the Old Testament is still said at Lauds after the third psalm. The extremely ancient custom of reciting psalms 148, 149 and 150 together as the last psalm of Lauds is done away with; however, it must be noted that the psalms chosen to replace them all begin with the word “Laudate” or “Lauda”. It is important to note that the antiphons of the Psalter are not said on the feasts of Saints. Instead, the ferial psalms are mixed with the antiphons of the feast, whether proper (as on Christmas) or taken from the common offices of the Saints; this or something similar to it was done in a number of medieval usages. The new Parisian use also maintained a common medieval custom (never observed in the use of Rome), whereby the psalms of Lauds and Vespers are said with only one antiphon on the lowest grades of feasts. The rubric “Concerning the Antiphons” is, not surprisingly, rather complicated. Paris was not in fact the first French diocese to rearrange the Psalter. The Gallicanized Breviaries of Sens, (of which Paris had been a suffragan see until 1622,) of Nevers and of Rouen had all re-arranged the Psalter in a similar manner in the previous decade; indeed, much of the new Parisian arrangement is borrowed from the 1728 Rouen Breviary. The importance of the Parisian revision is that it almost immediately became the model for the reform of other Breviaries throughout France ; the Breviary of Blois, published at Paris the following year, borrows the Parisian Psalter in its entirety. 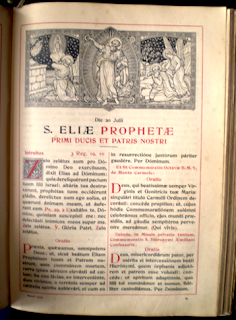 The reform of the Roman Breviary by Pope St. Pius X, in 1911 will also borrow heavily from this new Parisian usage; it will be discussed in detail in an upcoming article in this series. 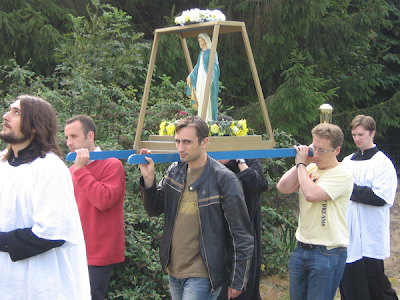 The NLM has mentioned Young Catholic Adults before, a UK based group of young Catholics attached to the usus antiquior who are affiliated with International Juventutem Federation. 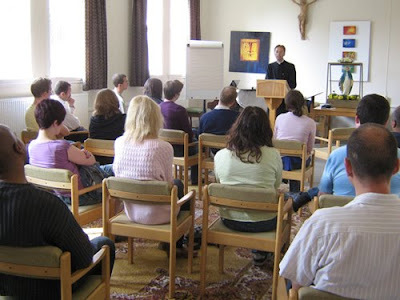 They recently reported on their retreat at Douai Abbey this past Sept. 18th-20th on their blog, noting that they had a turn out of approximately 70 people for the retreat. 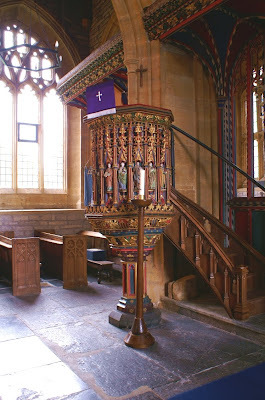 Those of you interested in views into the mediaeval English parish may be interested in some photographs Dr. Allan Barton recently shared of medieval pulpits still extant in England on his mediaeval ecclesiastical art site. Here is one of the most stunning. At St. Alphonsus Church in Seattle, Washington, Archbishop Alex Brunett celebrated a Solemn Mass in honor of the North American Martyrs Patronal Feast Day, complete with full Gregorian propers. The crowd was huge, with some 500 plus attending. A stunning photographic presentation can be found here. This was clearly a historic event. Here is a story in the press about it. "The congregation's participation could be described in two words, prayerful and contemplative." The editors of the Anglican Use Gradual (for use in the Catholic Church) are working on a long-term project of producing melismatic editions of large feasts, and the results are very satisfying. Here they are for All Saints Day. Here is a recording by Jeffrey Ostrowski. At Pandora , you can type any keyword and have a fantastic playlist built for you immediately. For example, type Palestrina and the world opens. Same with William Byrd. Or just Gregorian chant. All the work of making playlists is gone. Fantastic. This past 24th of September, Fr. Sean Finnegan celebrated his 20th year of priesthood. Some of you may remember Fr. Finnegan as the priest who celebrated the liturgies in the Sarum use within Merton College, Oxford in the mid 1990's. He celebrated his 20th anniversary with a Solemn Mass in the usus antiquior at St Peter's, Shoreham. Do stop over to Fr. Finnegan's blog, Valle Adurni, to both view more of the photos from the Mass as well as to offer him your prayers and best wishes. The NLM certainly extends these to Fr. Finnegan. The following videos will give you a sense of the recent ordinations held in the cathedral of Toulon by Bishop Dominique Rey, Bishop of Frejus-Toulon. 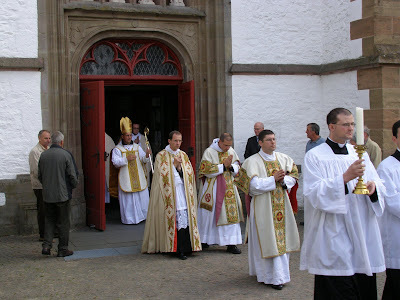 The ordinations were done according to the usus antiquior and held on September 26th, 2009. We shall attempt to find some photographs of the ceremonies. I had failed to notice this recent papal mention of the soon to be beatified John Henry Cardinal Newman. Pope Benedict XVI described the Venerable John Henry Newman as a “celebrated intellectual” and a “man of luminous spirituality”, in a homily during his recent pastoral visit to Viterbo. During his visit to the city, which is about 65 miles north of Rome, the Pope celebrated an outdoor Mass, visited the conclave room of the Papal Palace and went to nearby Bagnoregio, where St Bonaventure was born in 1217. The Papal visit to Viterbo, where five Popes were elected in the thirteenth century, took place on Sunday 6 September. The visit also brought the Pope to the region of Blessed Dominic Barberi, the passionist priest, who became famous through his contact with John Henry Newman. Pope Benedict, who has studied Newman since his time in seminary in the post-war years, approved in July the Decree recognising the miracle which will lead to Newman’s Beatification next year. The NLM is also watching with interest to see if the recently announced papal visit to the United Kingdom will result in the Pope's own personal involvement in the beatification of Newman. We will bring you details as soon as we can. A new piece has been posted on the site of Newman's Cause today which looks at Littlemore where Newman converted. What was the original connection between John Henry Newman and Littlemore? Newman was appointed Vicar of St Mary the Virgin, the University Church of Oxford, in 1828. Littlemore, on the outskirts of Oxford, had been part of the parish of St Mary’s for many centuries. So Newman became Vicar of Littlemore, too. Although a celebrated intellectual with a weighty load of teaching, he loved to take care of his parishioners, and visited the small and hitherto rather neglected hamlet of Littlemore several times a week. He built a church for the village, St Mary and St Nicholas, in 1835-6 and a school in 1838. 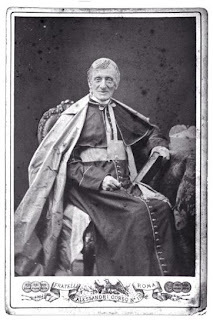 He remained Vicar of St Mary’s and of Littlemore until September 1843 when he resigned his ministry as his doubts about the validity of the church of England had become too strong. When did he move there permanently? Why? Newman moved to Littlemore in April 1842 to create a place of prayer and study. In 1841 he had published Tract 90 in which, in a series of scholarly arguments, he tried to reconcile the 39 articles of the church of England with Catholic Christianity. The result was intense conflict both in the University and among the Anglican bishops. Newman realised that he had to find an answer to the pressing question: was his position wrong or was the church of England in schism? So at Littlemore he rented the ‘Cottages’ in College Lane which had been a stage post for coaches. He converted the buildings for his needs. The former stable was transformed into his library and the granary into several cottages where he and some friends could share a life of study, prayer and penance. He called the building ‘the house of the Blessed Virgin Mary at Littlemore’. 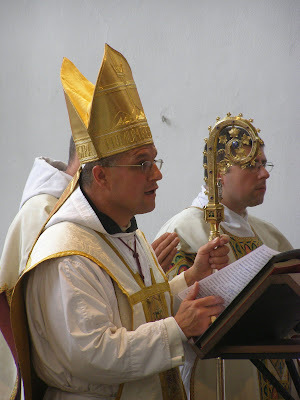 It’s well known that it was at Littlemore that Newman converted to the Catholic Church. Tell us more about that. Newman and his friends at Littlemore shared one desire: to find the truth so as to serve God better. They had all been brought up in the church of England but had become less and less convinced that it was the true Church of Christ. For Newman this process was particularly difficult considering the great intellectual and spiritual influence he had exercised in the church of England. He knew that a decision to leave Anglicanism would have consequences for many other people. After years of prayer, fasting and study he saw clearly that the Roman Catholic Church was the same Church as the Church of the apostles and the early Christians. He knew in conscience that he had to join it if he wanted to be saved. God’s Providence helped by sending him the Passionist Blessed Dominic Barberi. The two had met him briefly in 1844 and Newman had been impressed by his holiness. When Newman had made up his mind to be received into the Church in October 1845 he heard that Blessed Dominic would be travelling through Oxford. Via their mutual friend John Dobrée Dalgairns Newman asked the Passionist priest to call in at Littlemore. When Dominic Barberi arrived late in the evening of 8th October, soaking wet from his journey, Newman did not hesitate one moment, knelt down in front of him, and asked him for reception into the Church. He then began his general confession which he had prepared in the previous days and which lasted for several hours. The rite of reception, including conditional baptism, took place in the chapel next to Newman’s private room on the evening of 9th October. Two of his friends, Richard Stanton and E. S. Bowles, were received at the same time. Newman never regretted his decision. Not only in the Apologia, but also in many letters, he witnesses to the interior peace that always accompanied him as a Catholic, despite the well known fact that he was not spared difficulties not only from outside the Church but also within it. The chant pilgrimage at the National Shrine concluded with a Votive Mass of the Blessed Virgin Mary, extraordinary form, with Gregorian ordinary and propers, including organ by David Lang and the Shrine choir directed by Peter Latona singing Palestrina and Byrd. We had made 250 programs; we had no expectation of large attendance. I don't have precise numbers but there might have been 450-500 people. Certainly no one had expected this. Aristotle Esguerra has links to all audios. More video and images coming. "If any man would come after me, let him deny himself and take up his cross and follow me. For whoever would save his life will lose it; and whoever loses his life for my sake and the gospel's will save it" - Mark 8:34f. 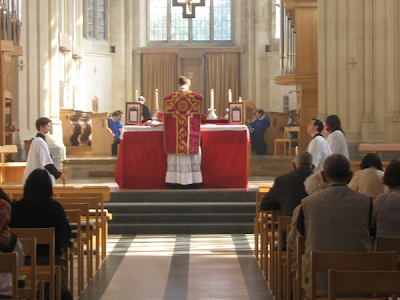 These words, from the Gospel for the 24th Sunday of Ordinary Time, were very appropriate for the solemn profession of Br Lawrence Lew OP which took place during conventual Mass in the Priory of the Holy Spirit, Oxford, on Sunday 13 September. Br Lawrence's friends and family had come from near and far to witness him make profession and promise obedience "usque ad mortem", until death. As the Prior Provincial of the English Dominican Province, Fr John Farrell OP reminded him, Fr Lawrence was entering into the obedience of Christ who was "obedient unto death, even death on a cross". So, the faith which we had all received in baptism has to be borne out in action and good works. Let us pray that the good work undertaken in making religious profession will be brought to perfection by our Lord Jesus Christ. Br Lawrence lies prostrate in the form of a cross and asks for God's mercy and the mercy of the brethren. The Provincial receives the profession and promise of obedience "until death" from Br Lawrence. "I, brother Lawrence Lew, make profession and promise obedience to God, and to Blessed Mary, and to Blessed Dominic, and to you, brother John Farrell, Prior Provincial of the Province of England, in place of brother Carlos Alfonso Azpiroz Costa, Master of the Order of Friars Preachers, and his successors, according to the Rule of Blessed Augustine and the Institutions of the Friars Preachers, that I will be obedient to you and your successors, until death." 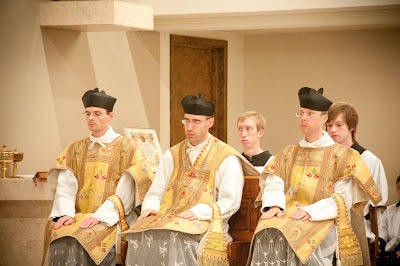 The Schola Gregoriana of Cambridge, dressed in their distinctive robes inspired by Benedictine cowls, sang the Propers of the Mass in Dominican chant: "Grant peace, O Lord, to those who wait for you, that your prophets may be found faithful: hear the prayers of your servant..." - from the Introit of the Mass for the 24th Sunday in Ordinary Time. Br Lawrence with his parents and uncles and aunt who had come from as far afield as the U.S.A., Malaysia and Singapore. Br Lawrence with his father and step-mother. One of the many elements of the Eastern Church which I have always had fond regard for is the prominence that we find there for the righteous figures of the Old Testament. 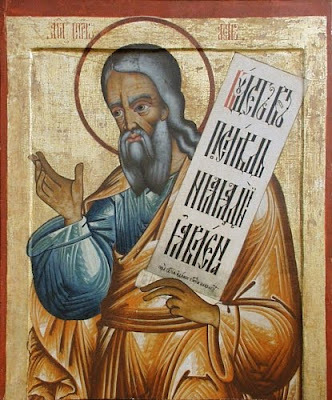 Within the Byzantine liturgical calendar for instance, a number of Old Testament prophets and righteous have particular feast days in which these holy men and women are commemorated. For example: Abraham (Oct. 9), Moses (Sept. 4), Malachi (Jan. 3), Zechariah (Feb. 8), Job (May 6), Amos (June 15), Isaiah (May 9), Hannah (July 23), to name a few. Also to be found within the Byzantine Hours are a number of canticles, such as the "Song of Moses", "the Prayer of Isaiah", the "Song of the Three Holy Children" and so on. Of course, within the Latin West, this tradition is also not absent -- even if perhaps not as prevalent as it is within the Christian East. For example, the calendar of the usus antiquior commemorates the Seven Holy Maccabees on August 1st, and within the Carmeilte liturgical tradition, St. Elias (Elijah) is commemorated as a feast day of importance on July 20th. Also worth mentioning is the fact that in the litany of the saints we invoke "Omnes sancti Patriárchae et Prophetae" (All ye Holy Patriarchs and Prophets) and within the Roman Canon, Abel, Abraham and Melchisedech are mentioned: "Deign to look with propitious and serene countenance on them, and to accept them, as you deigned to consider acceptable the gifts of your just servant Abel, and the sacrifice of our Patriarch Abraham, and what your high priest Melchizedek offered you, a holy sacrifice, a spotless victim." In the circular zone [of the dome] around the figure of Christ Pantocrator is depicted -- if space allows -- a choir of Angels. 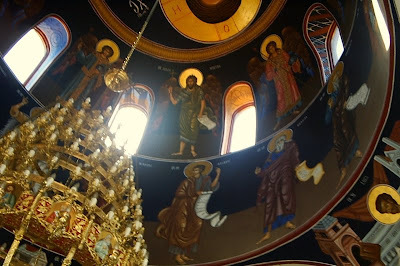 Often, between them are painted the Theotokos on the east side, and Saint John the Baptist on the west. If the circular base of the drum of the dome is suitable, various Righteous personages of the Old Testament are represented in medallions (busts enclosed in circles) -- for example, Abel, Abraham, Noah. 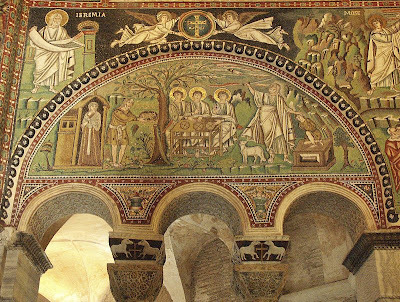 Within the sanctuary of Byzantine churches, one might also find Old Testament narrative scenes depicted on the walls. Those depicted are those which are classified as "types" of the Eucharistic Sacrifice, or Sacrifice of the Mass/Divine Liturgy. 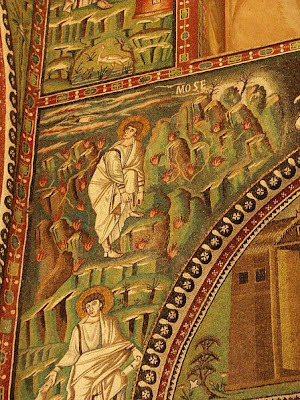 A good example of such typology would be the narrative of the sacrifice of Isaac by Abraham, where Abraham was prepared to sacrifice his own son. Finally, icons of the Old Testament prophets might also be depicted within the narthex of Byzantine churches, or on the iconostasis. Here are some examples of such icons. 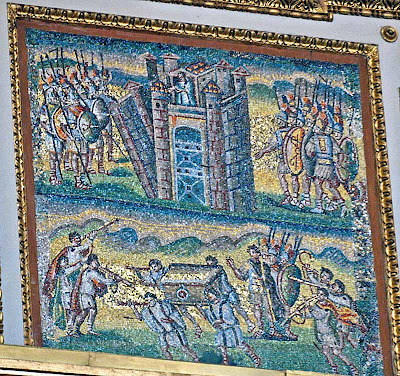 The Basilica of Santa Maria Maggiore in Rome contains a number of mosaics of Old Testament scenes as well. Other examples are also to be found elsewhere. Evidently some might still ask why this emphasis on the Old Testament? After all, are we not in the time of the new covenant? Yes, but here too I might suggest that we must adopt a spirit and understanding that is rooted in continuity rather than rupture; a spirit which understands that in Christ and the New Covenant, we see the fulfillment of the Old; that there is a relationship which connects the two. To paraphrase St. Augustine, in the Old Testament the New is concealed; in the New Testament, the Old is revealed. The mention of "types" came above in the context of the sacrifice of Isaac by Abraham, and in relation to Jonah. Types or prefigurements from the Old Testament are something that we find commented on in both the New Testament itself and in the writings of various Fathers of the Church. The use of typology can be extraordinarily powerful in helping us to understand the liturgy of the Mass for example, Christ as the sacrificial Lamb, Mary as the Ark of the New Covenant who bears the Word made Flesh and so on. In fact, I would suggest that our lack of familiarity with these things today may well be a contributive factor to some of the reductionisms that we tend to be witness to and which our Holy Father has spoken of in the past. 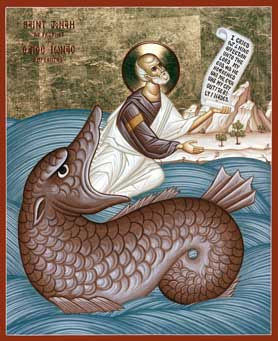 As a Byzantine Catholic cleric friend so aptly put it while I was conferring with him about the subject of this article, "Scripture, liturgical texts and icons work together in a coherent manner to bear witness to the Word made flesh, who is God among us."